White balance is one of those chapters of learning about photography which is not talked about much but is supremely important in making good images. New photographers just starting out get so caught up in questions like, what camera to buy? Do I get the kit lens or a cheap 50mm prime instead? Megapixel count of a new camera body, etc that they very often ignore the very basics of photography. I should know, I did the same. So, what is white balance? And why is it so important? Although this definition looks pretty easy and straightforward there are a few common mistakes that people generally make. Just hold on for some time and I will clear them all. Remeber when I talked about why I consider our eyes to be the best cameras in the world? It is not just our eyes though. It is the combination of both our eyes and our brain which is a lethal duo. Because over a period of more than 2,00,000 years, evolution has trained them to compensate, adjust and thrive in virtually any situation. Ultra fast focus, ability to see in both bright and low light conditions, gauge distance and speed of objects in milliseconds are just the tips of the iceberg. There is another phenomenal ability of our visual system which is not talked about that much….the ability to reproduce the color of objects consistently over a wide spectrum of light. Let me give you a common example to explain this. I am sure you have many types of light bulbs installed all around your house. Some are tungsten which emits a yellowish light, some are fluorescent which looks white colored and then maybe some red and blue colored LEDs. Have you ever noticed that in spite of all these different colors of light, a white object still looks white to you? Don’t believe me? Do this right now! Take a blank sheet of white paper and then go to the room which has an incandescent bulb. Hold on the paper in front of you for a few seconds. You will notice that the paper looks pretty white to you. Repeat the same exercise with all the colors and tones of light you can possibly find, I am absolutely confident you will come up with the same result. The white sheet of paper looks white irrespective of the color of light projected on it. What actually happens is that our eyes and our brain work in tandem to analyze the color temperature of the light it is working with and then factor them into the equation so that we see the ‘true’ color of the object. They continuously adjust and compensate for the color temperature of the light so that all the object looks the same color they actually are. Unfortunately, this is NOT the case with our digital cameras. Hence the need for white balancing. 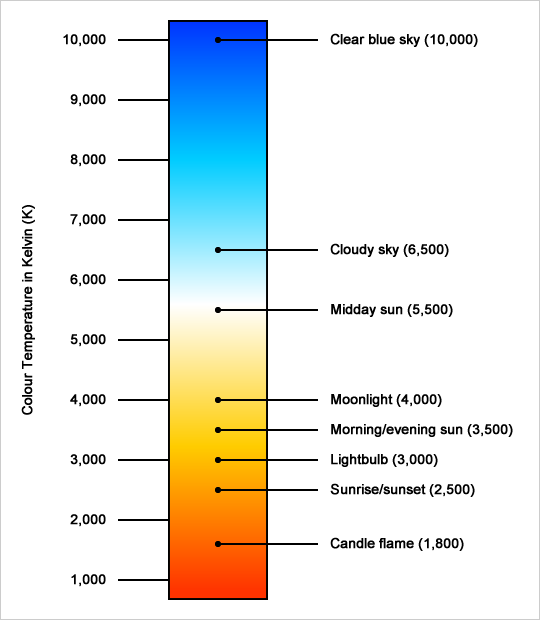 The color temperature of a light source is the temperature of an ideal black-body radiator that radiates light of a color comparable to that of the light source. Color temperature refers to a characterization of the spectral properties of a light source and is commonly used during the production phase in the film and photography industries”. Relax guys…I was just joking. I am sorry but I just couldn’t resist. Don’t panic so much it is actually very very easy. Color temperature is nothing but a measure of the color of the light. Like I mentioned before, you have various colors of light installed all over your house, right? Some are yellowish, some are white. some red or blue or whatever crazy color your CPU cabinet is emanating. Color temperature is just a way to categorize and name each of these colors. So when I ask you to use a particular shade of warm yellow light and give you the temperature value of it, you will know exactly which yellow light I am talking about. By the way, these temperature values are measured in units called Kelvin, denoted by the letter ‘K’. Now, if say for a particular photograph, “dial your light temperature to about 2500K to recreate the sunrise or sunset effect”. You can just use the value 2500K for your artificial light and hence successfully mimic the color of the setting Sun without any confusion whatsoever. We communicate better and instead of me saying “use a yellow colored light“, now we can be more precise. 2500K basically acts as the name for that particular shade of yellow. If you use more than a single source of artificial light, you can also use the color temperature values to sync all the lights too. This way all of them emit the same colored light and eliminate the possibility of any visual inconsistency in the scene. Perfect…everytime. Everything about color temperature seems okay and helpful for photographers and videographers except for one thing…how to remember so many values and their corresponding colors? Actually, you don’t have to. Just remember the pattern and understand the way the colors are assigned their values. If possible keep in mind some of the most used color temperatures such as daylight, candle flame, fluorescent light etc and you are good to go. The easiest way to remember the image is this. The temperature scales from red to blue. On the Kelvin scale, it ranges from 1000K to 10,000K. So red and blue on the extreme ends and just roughly in the middle where they meet is pure white (5000K). Once you understand this simple pattern it is extremely easy to have an informed guess about any color of light you may come across. Now that we know our eyes have the capability to adjust to light of different color temperatures and in the process always reveal the true color of the object, something that our digital cameras are simply unable to do, what we have to do now is help our cameras a little so that they too can “see” more clearly. We have a total of three primary options to visit. When I say automatic or full manual, what I mean is the way we communicate to our camera what it should consider as ‘true white’. It is actually providing a reference point for the camera to grab on. Depending on this setting the camera would then calibrate the rest of the colors of the image so that they seem as natural as possible. Every digital camera nowadays be it a point and shoot, a DSLR or a Mirrorless has a white balance setting called Auto White Balance (AWB). What this setting does is analyze all the elements of the scene and try and find out something that would give the camera a true idea about true white. 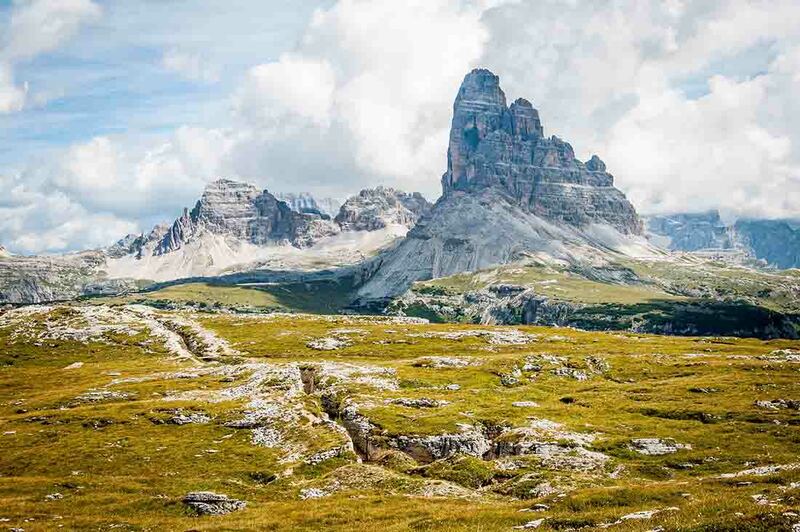 For example, say you are taking a photograph of a landscape. If the camera is set to Auto White Balance, when you point and press the shutter button, the camera looks at the scene and identifies the clouds as something which would reflect ‘true white’ in the given situation. The camera now taking the reference for white from the clouds in the given scene, calibrates the all the other colors of the rest of the image. When there is nothing in the scene which is actually white or bright and colorless that it can use as a reference. The scene is dominated by a single color. If your lighting condition is not changing rapidly and you have a pretty good estimate that it is going to remain the same for the foreseeable future, you can use one of the presets already built into your camera. Say you are taking photographs indoors, in your home using ordinary light bulbs. Since the source of the light is artificial, it is going to be fairly constant throughout. You can select the Tungsten preset here and that would send the message to your camera that it is no longer dealing with white light and that the white balance settings need to change. Now instead of guessing the color temperature of the light it is dealing with, the camera uses definite Kelvin values (about 3000K). So in effect whenever you select a preset white balance for your camera, you are actually indirectly dialing in a Kelvin value which the camera then uses for color reproduction of the image. This would be the way to take complete charge of the camera and not let it guess anything at all. Presets are fine to work with but I guess you would agree not all light bulbs emit the same colored light and all shades are different. So in order to be even more precise, so that the colors our camera produce are absolutely on the money, we can go full manual and actually input the Kelvin values ourselves. We can do this is two main ways. Manually dial in Kelvin values. Use a white or grey card for reference. Manually dialing in values is exactly what it sounds like. Nearly all modern digital cameras have the option to go into the white balance menu and then accepting inputs from the photographer. Each camera is different so you would have to consult your camera manual to find out how to input Kelvin values yourself. But don’t worry too much it is pretty easy. In most cases, you would have to use at most a couple of buttons and a dial maybe. This way to actually putting in the exact Kelvin values yourself into the camera is the BEST possible and the most accurate way of fine-tuning your white balance. The catch, however, is that YOU would have to know the correct color temperature of the light in the first place. This is easier said than done. There are devices which measure color temperatures but using them would further slow down your workflow and probably turn out to be counterproductive. 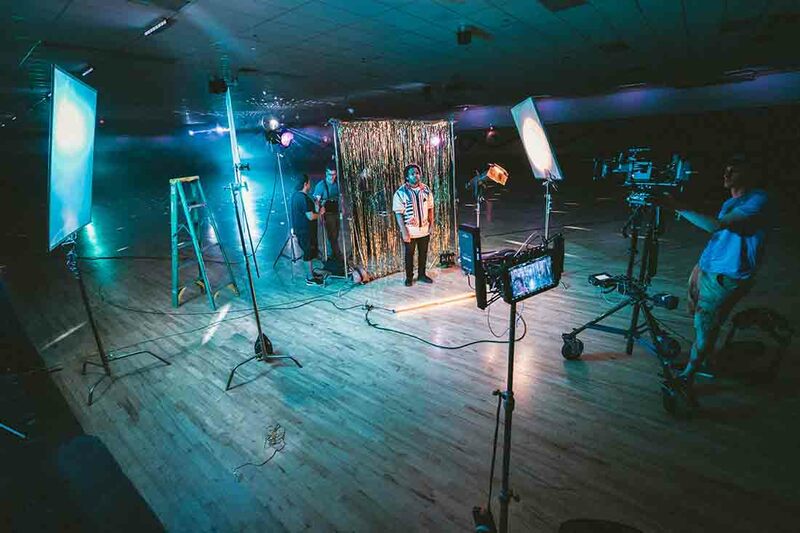 If however, you have the perfect knowledge of the color temperature of the light you are using; like say when you are shooting in a studio with just artificial lights which consistently produces light of a particular color temperature, manual Kelvin value would be the way to go. This by far the easiest and the most practical way to get your white balance correct. I say the ‘easiest’ since all you have to do is click an extra image….seriously that’s it. I just explained how Auto White Balance works a little while ago…..remember? Okay, let me refresh your memory once again. In AWB, the camera would try and find an element in the given scene which is either actually white or appears to be bright and colorless. Then using this ‘white’ element as a reference calibrate all the other colors of the image…..correct? By shooting an image of the white or grey card what we are doing is ensuring that the camera has this ‘white’ element. So we are no longer banking on happenstance or probability but actually providing the camera a concrete and stable source using which it can accurately remap all the other colors. Navigate to the white balance menu on your camera and select PRE(Nikon) or Custom(Canon). Frame your shot with the subject in it. Hold up the white/grey card in front of your camera where the subject would be otherwise and take an image. Now your camera would ask if you would like to use this image as the reference white balance, just say yes. That is all. All the subsequent images that would take from that point will use the image of the card as a guide and align the colors accordingly. If you do not want to slow down while you shoot at all and postpone all your white balance corrections till you are in the editing room, it is fine. For this process to work most effectively you got to shoot in RAW. Since RAW is actually unprocessed and unedited version of your images it naturally holds the highest possible details your camera could capture. Photo editing software like Lightroom and Photoshop have made it stupidly easy to calibrate white balance in post-production. You can either open up an image and choose a white balance that looks right to your eye or you can use an image of a white card as a reference (like the one we were talking about earlier) and use that to calculate the correct wb setting. Once you are done adjusting and fine-tuning the correct setting of a single image all you have to do is sync the white balance setting across all the other images shot under the same light. Over the years I have found that the fastest way to visually check the white balance setting of my camera is to use the Live View. DSLRs have optical viewfinders and they do not do a good job of representing how the final image would look like in terms of wb. Live view, on the other hand, is a good, reliable and real-time visual representation of the image you would get if you press the shutter. (Unfortunately, I have no idea how the electronic viewfinder of mirrorless cameras handle this). Personally, I use the RAW+AWB combo for nearly all of my shots. This not only gives me the flexibility to change or tinker with the WB setting should I need it in post but also allow me to shoot in a wide range of images without thinking about WB too much. It is a set it and forget it approach. You can use it too if you want, works pretty well for me. Do not freaking ignore white balance like the millions of ‘photographers’ out there, even if you shoot just black and white images. How your camera understands and reproduces color is of utmost importance. It just takes a few seconds to get it right, so why not just do it. Carry that white card around and click that extra shot. Trust me if you do this right your images would look much better than with a distorted wb setting. These little things do add up in producing a great image. Rome wasn’t built in a day and neither are good images. Like always, keep shooting amazing.